The Georgia State Panthers held their first Blue-White Spring Game at the Georgia State Stadium on Saturday, and it was an exhilarating event from start to finish, with the offense outlasting the defense 59-35. Both units displayed great effort and gave the fans much to be optimistic about this upcoming season, highlighted by three quarterbacks vying for an opportunity to replace last year’s AutoNation Cure Bowl MVP Conner Manning. Transfer quarterbacks Dan Ellington, Aaron Winchester and Jack Walker make up the group who individually had impressive outings. “All in all, I was very pleased. It was our first Spring Game at Georgia State Stadium, and that’s amazing,” head coach Shawn Elliott said to a few media members in attendance. “All three of our quarterbacks went out there today and executed really well and delivered the football. I think we’ve got three pretty good quarterbacks, plus Parks when he gets back,” Elliott said. While great quarterback competition is beneficial to the football team, it is also a tough decision to make when naming the captain of the team’s offense, which Elliott said he is not ready to do just yet. As a transfer football player, there is a considerable amount of pressure to prove to the coaching staff why they are worthy of being a part of their football program. However, Ellington showcased precisely why he can very well be the man for the quarterback job. He had a phenomenal day throwing the ball as he was 21-for-24 for 249 yards and four touchdowns. For one touchdown, he threw the ball to men’s basketball head coach Ron Hunter in the back of the end zone. Nonetheless, Ellington showed great poise in the pocket and did not seem anxious when the defensive line generated pressure from the interior and exterior. Instead, he made the necessary adjustments and threw crisp and accurate balls during his time on the field. The most significant difference Winchester made from last year to this year is the transformation he made to his body. Winchester looked insurmountably bigger, faster and stronger — which will be an advantage for him in the quarterback competition. He also showed maturity in the pocket, especially with going through his progressions. Last year, Winchester was known as a run-first style quarterback. During the spring game, he was able to showcase his strong arm by throwing with much velocity on occasion. Winchester finished the game completing 17 of 25 passes for 173 yards and three touchdowns, while also catching a 17-yard pass from Jonathan Ifedi on a trick play. The youngest quarterback of the bunch made his much-anticipated appearance on the field for the Panthers and showed much promise. 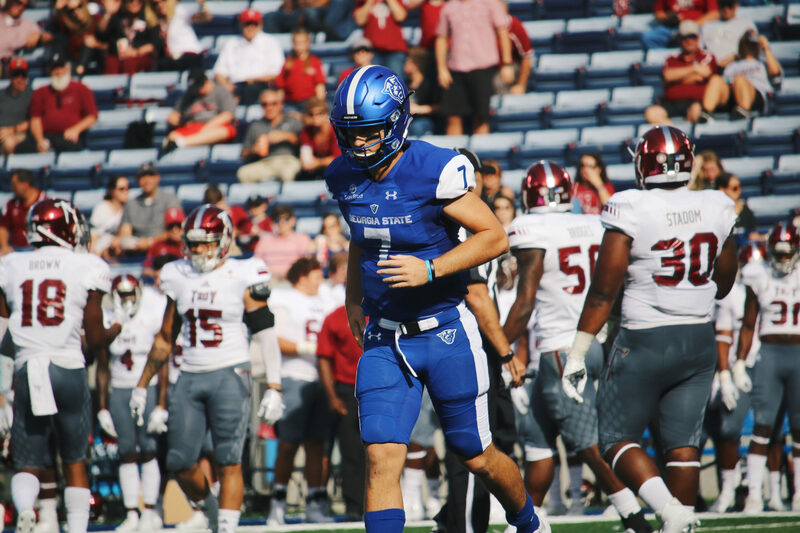 Walker spent last year holding a clipboard on the sideline and soaking up the playbook, but when he stepped onto the field on Saturday, he went into quarterback mode by fluidly orchestrating the offense and finding the open receivers. He was not as sharp as the older, more experienced quarterbacks, but Walker proved that he could push the other guys for the starting spot. He finished the game completing nine of 16 passes for 169 yards, including a 24-yard touchdown pass to redshirt freshman Camryn Johnson. The tight end group, led by Ari Werts, flashed multiple times during the game. Werts showcased what many knew he possessed, being a threat in the endzone. He caught two touchdowns with his most memorable being a 4-yard pass from Ellington that was initially tipped by a defender. His other touchdown was for nine yards from Winchester. Werts finished the game with five catches for 40 yards and two scores. Camrin Knight, the transfer tight end from Florida, made an exceptional first impression with his six catches for 100 yards and one touchdown. He was the only pass catcher to eclipse the 100-yard mark in the game. His lone touchdown came in the final seconds of the fourth quarter when Winchester threw a 25-yard laser in traffic. Coach Elliott has multiple decisions to make before opening day, but whoever wins the job at quarterback has dependable assets around him to give the Panthers an opportunity to win. The Panthers’ opening day is Aug. 30 against Kennesaw State at Georgia State Stadium.